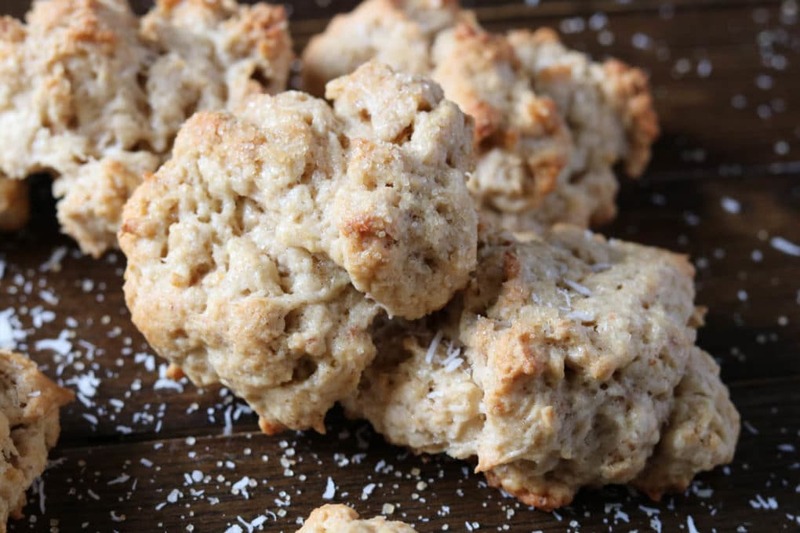 These coconut banana bread cookies are not only gluten-free but soft and moist just like a good loaf of banana bread. There’s just a hint of coconut, and to be honest I didn’t really taste much coconut, but it gives the cookies some texture and helps bind the ingredients. 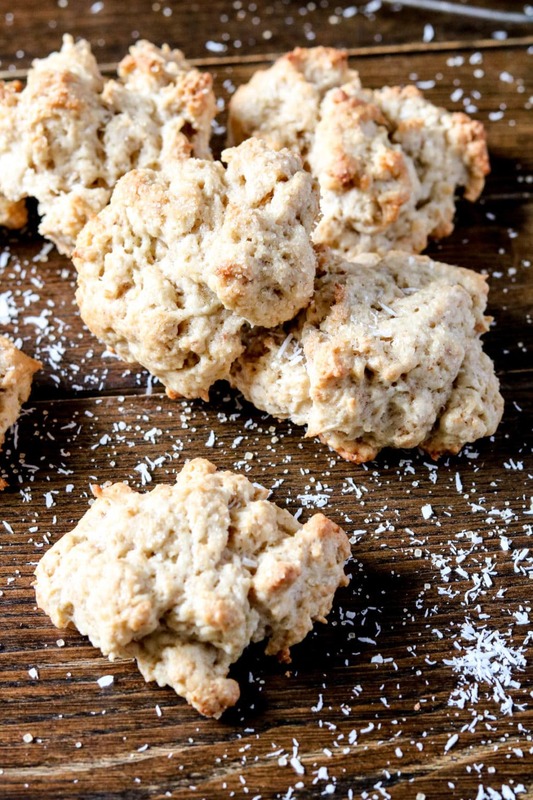 For a gluten-free cookie they’re pretty moist and the family devoured these. So much so that I had to make two batches one weekend just to keep them satisfied! I did use turbinado sugar for these cookies for the final touch on top. I wanted a larger grain sugar for the top which was actually the perfect addition. It gave the cookies a nice sugary crunch. As always, remember that even gluten-free, organic sugar cookies are still cookies. So if you’re working to keep your sugar monster in check, these do have plenty of it! 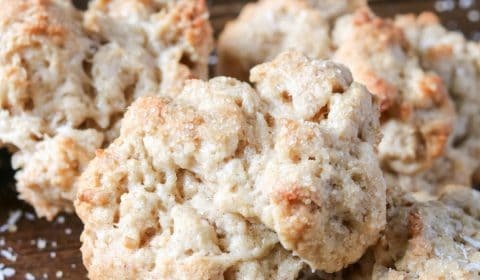 But if you’re looking for a healthier treat alternative to traditional cookies, these will do the trick! I would also highly recommend using finely shredded coconut as opposed to the larger shredded coconut. 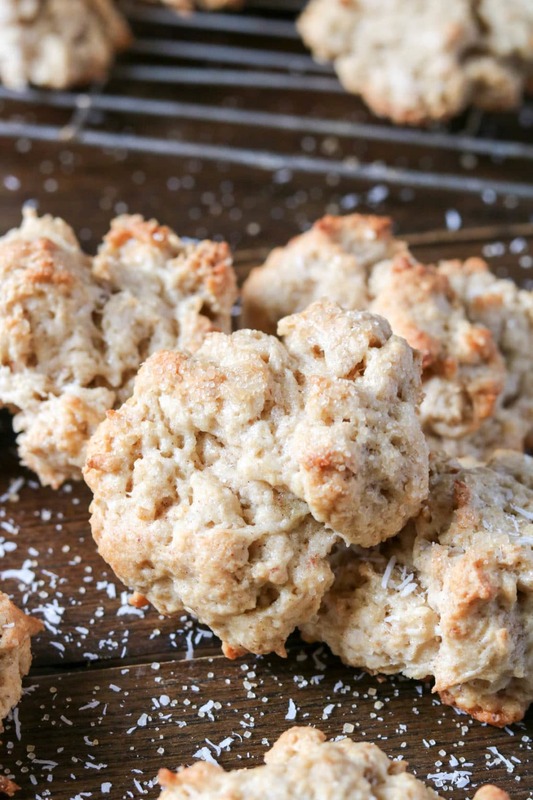 It will help cut down on the coconut texture and let you enjoy more of the moist banana bread cookie. I made this recipe 3 times trying to get it just right! Depending on what gluten-free flour blend you’re using, you might play with the flour amounts. I landed with 2 1/2 cups of flour to the amount of butter and eggs. In a large mixing bowl, mix together the softened butter and sugar with a hand or stand mixer. Add the eggs and egg white, and vanilla, mixing together again. If your banana is not ripe, add the banana to a food processor and blend. Then add the banana to the mixing bowl and hand stir until combined. If your banana is already ripe and softened, simply mash the banana with a fork and add to the mixture. Add in the dry ingredients to the bowl; flour, baking soda, salt, cinnamon and coconut. Mix well by hand. Using a spoon, drop the dough onto a greased or lined baking sheet. Sprinkle with large crystal turbinado sugar and bake for 15 minutes.